First, I have to say I enjoyed it - a frothy cocktail of writers blended with a healthy dose of literary agents, book doctors and a few publishers, generously fueled with alcohol in the evenings. It made for a happy event, even if quite a few of us were bleary-eyed this morning. It kicked off well with some workshops on Friday afternoon followed that evening by a competition called Authonomy Live, where eight unpublished authors strutted their stuff (around 500 words), were judged by a panel of three agents, and then by the audience. The runaway winner was a mature lady with a titillating story of ... well, er, how shall I put it, a young girl discovering uncharted zones of her body... She swept the board, though I have to say my mate Gideon's was brill and Divya (now aka Lakshi) for me had the best 'performance piece'. An hour long keynote speech by 76 year old David Nobbs was VERY funny, focusing on everything that had gone wrong in his 48 years in the business of writing fiction, plays and TV (he wrote The Rise and Fall of Reginald Perrin, for example, quintessential English sitcom). There were plenty of workshops on a range of issues from how to find your 'voice' and how to 'show-not-tell', to writing query letters & synopses, genre-specific classes on children's fiction, crime, science fiction, all the way to self-publishing. Many of these, and to me the whole conference, are aimed towards new writers who are either well into their first book, or have finished their manuscript and are searching for an agent. The conference is of course also useful if you are looking to change your agent. The atmosphere is convivial and the agents/publishers/book doctors were all very approachable, but also I was impressed (as last year) by their professionalism. They generally tell it how it is, which of course is not always what you're hoping to hear. And many of them pointed out that the industry is changing rapidly. There were energetic Q&A sessions on a range of issues, and the subject of Ebooks and how they would affect the publishers business model kept coming up. Royalties were discussed for Ebooks, which seem to be around 25% if part of an ebook / paperback deal, maybe higher (e.g. 40%) if ebook only. The UK is seen as about a year behind the USA in E-sales, and we won't really know till later in the year whether the Xmas bonanza on Kindle sales in the UK has created a sustained shift towards digital media. One to watch. A highlight of the weekend for every writer was the 'one-to-ones' they can have - a strictly ten-minute session with an agent or publisher or book doctor, who should have seen a submitted piece of the writer's work. What is interesting about these is that everyone is allowed to see two people, one at a time, and sometimes two of these industry professionals can have completely different perspectives on whatever a writer has submitted (e.g. from rubbish to brilliant, for the same piece). Perhaps it's part of the necessary training for writers to ram home a fundamental rule: appreciation of writing is subjective, so if you take a knock, brush it off and keep going. All in all a very good and well-organised event, especially because there were so many people from the industry, so it was not just writers talking to other writers, which we can always do anyway (and we all did plenty of that, too). As I said in my short story Writerholics Anonymous, writing (or at least publishing) is a contact sport, and this festival is a great event to see and meet people in the industry. And even when they give bleak outlooks for the future, they absolutely believe in writing and in writers, not just because their livelihoods depend on it. Few people in writing and in publishing are in it for the money - they're just passionate about writing. And at this conference that was coming across loud and clear. I bought two books while there - the 2011 Writers Yearbook, and the main event organizer Harry Bingham's new book on how to survive the publishing industry as a writer. I just started it, and so far it hits the spot. Above all, when you write, enjoy it, as at least that way someone will have enjoyed it. 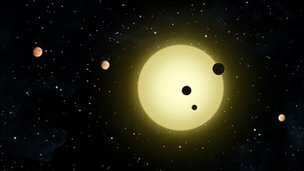 Thanks to the Kepler telescope amongst others, around 1200 new planets have been found. Most of these are gas giants, but around 58 detected so far could support life. One of the nearest new planets is around 20 light years away; still hopelessly beyond our current reach, but one day, someone (probably not Apple this time) will crack the faster-than-light speed problem. By the time a truly habitable one is found, and a means of transport exists, we may have exhausted our planet's resources, or had a nuclear war, or just toxed up our world so much that people will be desperate to move, and corporations and governments will be equally desperate to stake a claim on new resources. When I started writing The Eden Paradox I thought finding planets would be a long way off. It may well be that we are tantalised for a couple more centuries by good-looking second homes before we can move in, because we can't get there in the space of a single life time. But the way technology advances, maybe it won't take that long. In the meantime, the gap between science fiction and reality starts to close. We live in exciting times. One of the things a SF writer has to do - which is a lot of fun - is build a world (or galaxy, or universe). There are some basic questions to start with: Is humanity alone? If not, are we top dog or easy meat? How do people get around? Does long distance travel uphold Einstein's relativity laws or sidestep them? Is it a fun place, a dangerous place, or Dystopian? That's just for starters... Then the writer has to add rules - these are the unwritten rules of how things work in this galaxy, i.e. its culture. The writer has to stick to the rules, even if the protagonist flouts them (knowingly). Once this 'frame' is in place, readers can enter and immerse themselves in the story. Second universe is Hell, and is a short story universe: still plenty of aliens but more sluggish transport systems. Hell, as in the short story 'Looking for Hell' is a 'fun and extreme-danger' place to be, and I liked it so much and its aliens, and the publisher did too, that I'm working on the sequel (Escape from Hell), which should also be a lot of fun. Most of the sequel takes place in Hell itself, so I have to create a SF-rationalised version of Hell, including why anyone would build Hell in the first place (there is profit to be made). The third universe is Sphericon, set about 400 years into the future, and here man is top dog. This is short story but also serious stuff - the first one called the Sylvian Gambit, is about to come out, and I've just finished the draft of a second Sphericon short story called simply 'The Meeting'. Sphericon imagines a ruthless way forward for mankind, and in effect it's a universe where most species are afraid of humanity. If you think about it, and study man's colonial history and tendencies, it's not such an unlikely prospect. The story that starts humanity off on this particular trajectory is in my head but not yet on paper. So, three SF universes. I hope something for everyone in there :-) And my inspiration right now? Well I'm reading Matter (Iain Banks), Coalescent (Baxter) and Nova Wars (Gary Gibson). These don't necessarily feed my universes, but I pay close attention to how they develop theirs. Recently I seem to be stuck writing either my Eden saga or about Hell. The (wonderful) editor at Piker Press (Sand Pilarski) suggested I write more stories from the Looking for Hell universe. Since I really enjoyed writing that piece, I started writing a sequel, called Escape from Hell, and decided to blow the lid off what Hell really is... yes, you've already guessed it, it's an alien soul-processing factory. Well, for the details, you'll have to wait and see. A warrior obsessed with death went to see a Zen master. "I understand you know about heaven and hell. Since I am a warrior and will surely die soon, I wanted to know more." The zen master sipped his tea, not even looking up. "You seem to me like a poor warrior. Probably you'll be dead sooner than you think, why should I waste my time with you?" The warrior, enraged, began to draw his sword. The zen mast looked up. "Here is hell." The warrior stopped, realizing the discipline of this man. He sheathed his sword. The zen master smiled. "And here is heaven." The warrior bowed and left. I'll add something to the original story: Afterwards, this warrior never lost a battle. He died of old age surrounded by his grandchildren.